Boots 17 Lasting Fix Midnight Sapphire was one of the pressies that went on the nails almost immediately. It covered well enough at two coats, but three went on cos that is how I roll. It's got a nice royal blue shimmer to it that the Old Camera sadly couldn't pick up. You can just about make out some shimmer in the photo but there's a lot more of it IRL. Unaware that there would be new camera, I put some Nubar Night Sparkle (another pressie \o/) over the Midnight Sapphire and went, "oooooh pretty" for a while and did stuff. Around this time New Camera came along and photos of glittery nails were taken. 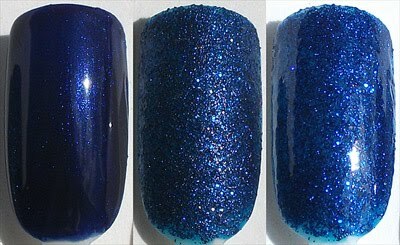 Night Sparkle is the most gorgeous blue glitter polish that I have ever seen (but I've not seen all that many TBH). 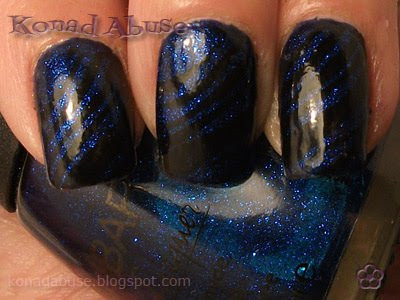 The glitter is very blue, very dense and covers wonderfully but it does like to slurp up the topcoat. I had to cover it with two good coats which really made the blue glitter look amazing, so amazing it was kept as is for a couple of days. Blimey. It got a gratuitous Konading at the end of the weekend, using the stripey pattern on Bundle Monster plate BM207 and Superdrug MUA Shade 2 (black) polish. Going to try and set some sort of record with this one and try and keep it on a bit longer. *Late edit: Trying to get the hang of New Camera by playing with macro mode and I felt compelled to put up more pictures of glitter. 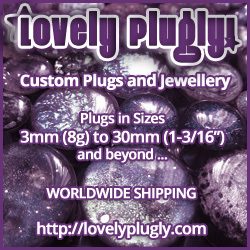 First, a happy belated birthday to you! May I ask what brand of camera you were regaled with? It does take nice photos! Thanks :) The camera is little Fuji AV130 -- got recommended it because it takes good macro pictures of glitter. Didn't This Used To Be A Lippie?